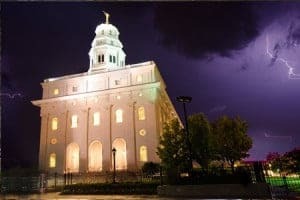 Night photo of lightning surrounding the Nauvoo Temple in Illinois. On my mega-long road trip last week, I stopped to do photography in the beautiful city of Nauvoo, Illinois. The city is full of rich history which is related to my religion, so it was an especially important shoot to me. I planned to wake up at 5AM to get out and shoot the sunrise, but I awoke at 3:45AM to lightning and thunder outside my hotel room. Seeing the rain and lightning, I sprung out of bed to get out and shoot the weather. Any experienced photographer knows that bad weather is often the BEST weather for taking landscape pictures. I drove half an hour to the LDS Temple in Nauvoo and started taking photos. At first, I wanted to get pictures of the lightning around the temple, so I used a cable release to get exposures of about 2 minutes with the camera mounted on my Induro Tripod. The results were good, but the lightning simply did not give the photo the feel that I wanted to achieve. You can see that first photo on the left. The lightning was cool, but it wasn't quite what I wanted, so I walked all around the building trying to find the right angle. At this point, the heavens began to empty. It was POURING rain and I was drenched from head to toe. My Nikon D7000 has weather sealing, but certainly not enough to withstand a downpour. Unfortunately, I didn't take my own advice to buy a cheap $5 rain cover for my DSLR, so I had to improvise. I found a plastic sack from a store and tied it around my camera with rubber bands to keep the wind from blowing it off. I sat in the car getting ready, selected f/16, 25 seconds shutter speed, ISO 200, and sprinted out of the car to snap off a couple pictures. At this point, I was pretty afraid that this picture was going to cost me a couple thousand dollars to replace my camera and Nikon 10-24mm lens. I took one picture and only had a few water drops on the lens, which were easily masked out in Photoshop. I snapped one last frame, but by that point the front element of the lens more closely resembled a cold glass of water than a piece of photography equipment, so I sprinted back to the comfort of my car and spent the next 10 minutes drying off my gear. The results? Worth it… see below. 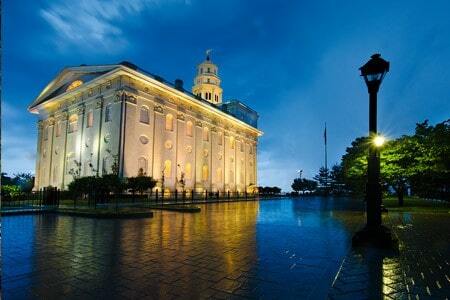 The LDS (Mormon) Temple in Nauvoo, Illinois.